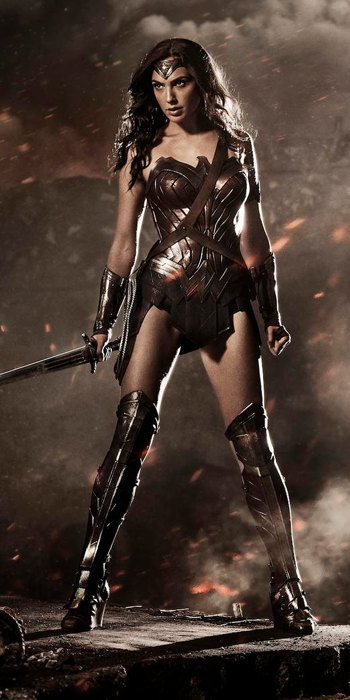 To your right: The first official image of Wonder Woman as she will appear in Batman v Superman: Dawn of Justice. The sepia toned filter of the poster makes it a little difficult to discern what color everything is supposed to be, but otherwise this image (tweeted moments ago by Zack Snyder during Warner Bros SDCC presentation, which also featured an exclusive few moments of teaser footage) reveals a fairly classically-designed Wonder Woman uniform. While some had suggested she may sport the modernized jacket and pants combo from the early-2000s reimagining, this version appears with the standard torso-armor and skirt, along with knee-high armored boots and a tiara. The breastplate is shaped like an eagle, calling back to the pre-WWII original design, while the belt forms a rough "W" symbol. In the poster she carries a sword and lariat - it's been suggested that in the film she'll utilize multiple melee-style weapons. Created in 1941 for DC Comics by Psychologist and polygraph-inventor William Moulton Marston, his wife Elizabeth and their partner Olive Byrne, Wonder Woman is widely considered the most well-known female superhero in the world. Dawn of Justice will mark her first appearance in a theatrical film, though the character has previously been the subject of a TV movie and a popular live-action series starring Lynda Carter.